Mah Sing Group Bhd, the country's fifth largest property developer, is looking for land in Sabah to build residential homes and villas for foreign buyers interested in the "Malaysia My Second Home" (MM2H) programme. Group managing director Tan Sri Leong Hoy Kum said the company was seeking land in Kota Kinabalu to develop into a mixed range of properties, including villas and residential homes. "We want to build more houses that can be sold under the MM2H programme and are looking at buying land near the beaches or anywhere in a prime area, or with potential to become a prime area in future," he told reporters after Mah Sing's extraordinary general meeting in Kuala Lumpur yesterday. "We decided on Sabah because we find that many foreigners are interested to buy properties there." The group is on track to meeting its RM1 billion sales target for the year through several property developments in the Klang Valley, Penang and Johor. "We are on track to achieving our sales target, based on our performance in the first three months of this year during which we hit RM516 million. That is three times more than the RM170 million sales achieved in the same period in 2009," Leong said. The group also plans to acquire at least 405ha in prime areas in Selangor and Johor Baru. "We have bought two pieces of land since the beginning of the year and are looking for more land to buy, especially in prime locations in Selangor." Mah Sing has a gross development value and unbilled sales of RM6 billion, which provides earnings visibility for about six to eight years. Last year, Mah Sing posted RM94.3 million net profit on revenue of RM727 million, surpassing the year's initial target of RM453 million by 1.6 times. Leong also said that the group's shareholders had voted and approved its proposed bonus issue of up to a maximum of 151,283,858 new ordinary shares of RM0.50 each on the basis of one bonus share for every five existing ordinary shares of RM0.50 apiece. PETALING JAYA: Mah Sing Group Bhd is on track to achieve its RM1bil sales target this year, having hit sales of RM516mil in the first three months. Managing director Tan Sri Leong Hoy Kum said in a statement the achievement was three times the RM170mil sales registered in the previous corresponding period. He said the company had gone on an acquisition trail last year to secure prime land and expected to see some results this year. The group has landbank with a gross development value and unbilled sales of about RM6bil, which provides earnings visibility for about six to eight years. The group plans to launch about RM1bil worth of properties this year, comprising industrial, commercial and residential projects in the Klang Valley, Penang and Johor. The group posted a net profit of RM94.3mil last year with total sales of RM727mil. Shareholders at its EGM yesterday approved its proposed one-for-five bonus issue of up to 151.3 million new shares. AS PENANG'S property scene remains on the boil with developers offering newer and pricier accommodation and commercial options, a new trend in property investment is emerging, notably in George Town's heritage enclave. In contrast to land reclamation projects, those on hillslopes and efforts in building on virtually any and every available space on the land-scarce island, a group of property investors are out to prove that "old is gold", infusing new life into heritage buildings and giving conservation an economic context. From foreign retirees to young people who are starting off a business, the address of choice for their premises seem to be centred around the inner city, which saw a migration of its residents a decade ago. In place of dilapidated shophouses and abandoned pre-war homes are now chic eateries, boutique residences, private dwellings and quaint shops, which make walking tours to visitors very refreshing. Although the interest in heritage properties is not new, a spike was noted when the Rent Control Act was repealed in 2000. "George Town has always been synonymous with its historic buildings," notes One Asia Property Consultants (Penang) Sdn Bhd chief operating officer Lim Ewe Tatt. He attributes George Town's conferment as a World Heritage Site by Unesco to one of the reasons why there has been a recent surge in the number of eateries and boutique accommodation. 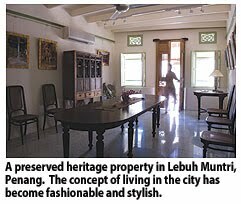 "The need to preserve our heritage comes along with it," he said, adding that demand for heritage properties is currently centred within George Town's inner city in sites such as Lebuh Armenian, Lebuh Muntri, Lorong Stewart and other streets boasting structures with beautiful designs. Award-winning architect Laurence Loh - who is synonymous with putting Malaysian conservation efforts on the world map with the Cheong Fatt Tze Mansion or La Maison Bleue (the blue house) - blazed a trail in architectural conservation in Malaysia, long before the issue even became trendy or understood. He has to date, worked on some 30 conservation projects in George Town, of which about 70 per cent have been commercial in content. Loh's first conservation job was the Cheong Fatt Tze Mansion on Lebuh Leith, which he describes as a challenging project. "This was because in 1990, I did not have any working or hands-on knowledge and training in building conservation, nor attended a single course. "There was no Internet, so reaching out for help and advice was difficult from a statutory point of view. The laws for protection of heritage were also non-existent," said the deputy president of Badan Warisan Malaysia. Conceding that the World Heritage inscription has placed George Town and in turn, the whole of Penang under the microscope, Loh added: "World attention has zoomed in on us and the advantages and opportunities are beginning to be apparent." People, Loh said, are exposed to the heritage values of the place and is a greater awareness now. "The concept of living in the city that was formerly alien has become fashionable and stylish." "Pre-war properties usually encompass several units which are sitting on one title and if you are to analyse it, it is cheaper than buying into a property with its own qualified title," said Lim. "The price range could be from RM200 per sq ft to RM500 per sq ft, depending on the location, size, condition and other considerations." On whether the latest wave in heritage property investments is likely to see a revival of activity in the historic enclave, Lim said: "We anticipate a revival of commercial activities in the area but we doubt it will bring back the residents. "One of the reasons is the lack of car parking space in this area, and rentals are no longer affordable to the lower-income group who used to stay here." Although the current trend serves as a boost for the city, Loh said that the only critical factor to it is that the authorities have to really look into managing change. "They cannot allow market forces to dictate the direction of pace or policy," he added. NUSAJAYA: The construction of six buildings expected to house more than 50 federal departments and agencies in Kota Iskandar here will commence next year. Historical record: Ghani, State Secretary Datuk Abdul Latiff Yusoff and Ghani’s wife Datin Paduka Dr Jamillah Ariffin looking at the coffee table book in Nusajaya. Johor Mentri Besar Datuk Abdul Ghani Othman said the buildings which cost RM1bil would be built in the northern part of Kota Iskandar, the new state administrative centre. “The project is expected to be completed in two to three years. It is part of the Government’s expenditure under the 10th Malaysia Plan,” he told reporters after launching a coffee table book entitled Johor In the 21st Century: The Making of Kota Iskandar here recently. Abdul Ghani said the book delved into events behind the development of Kota Iskandar. “The state realised the need for a new administrative centre to replace Bangunan Sultan Ibrahim. The project involved Johoreans especially in the design of the buildings,” he said. “The book sheds light on the first phase of Kota Iskandar involving the construction of the State Assembly building, the Mentri Besar’s office complex, Dataran Mahkota and other government offices in 2006. “It illustrates how the building designs are inspired by Johor Malay history and Moorish elements,” he said. The book which cost RM200 also served as a reference on the history of Kota Iskandar, he added.